Restoration projects bring the past to life, reanimating history for the aesthetic, educational, and functional benefit of residents and visitors alike. The Lowcountry is dotted with beautiful structures representing our textured cultural heritage. We apply skill, care, and innovation to ensure that these testaments to our region’s rich architectural story can be told today and long into the future. The Cathedral of St. John the Baptist is the seat of the Bishop of Charleston and the mother church for Catholic parishioners in South Carolina. Construction on the striking brownstone Gothic church began in 1890 to replace an earlier structure, which was destroyed in the Great Charleston Fire of 1861. In keeping with the Gothic architectural tradition, the plans for the Cathedral called for a steeple – but the parish did not have sufficient funds to build it at the time. Fast forward to the 21st century. 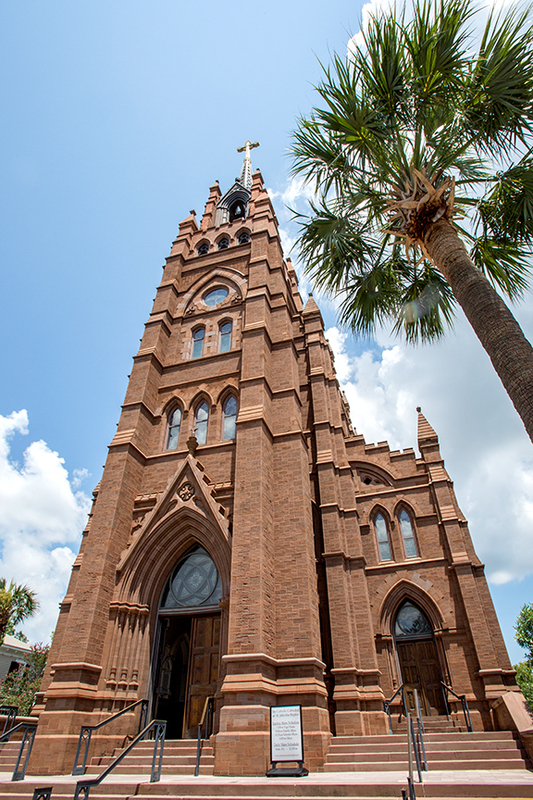 The Diocese of Charleston retained Hightower Construction to conduct a major renovation of the city’s iconic cathedral. Hightower completely restored the exterior of the 27,000-square-foot building, which involved the meticulous examination of every stone, the skillful replacement of 2,500 pieces of stone, repointing 27 miles of joints, and the construction and placement of a bell tower and – after more than a century of waiting – a steeple. The Hightower team designed the steeple using an innovative combination of cold molding, epoxies, and frames, enabling the steeple to reach 85 feet – even higher than the Diocese’s expectations. 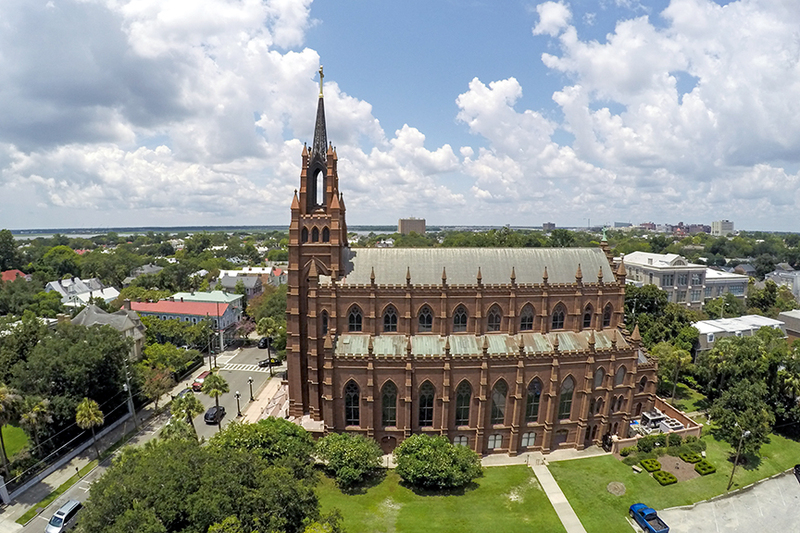 Today, the Cathedral stands tall at the corner of Broad and Legare Streets, with the structural integrity and full splendor intended by its designers more than 125 years ago. ...I hope that we will find ourselves working together on a future city project. Contractors like you make my job very easy. As in all restoration projects, there were unforeseen conditions that were uncovered. The Hightower team quickly responded and solved each of these. The quality of the restoration speaks for itself and has attracted national press attention. The quality of what you accomplished, the workmanship, the craftsmanship, and dedication to completing a very difficult job is a testimony to Hightower Construction Company. ...The community as a whole is fortunate to benefit from the professionalism and expertise of a company such as yours. Your record of competency, efficiency, and safety is first-class, and I feel sure that the County personnel who have worked alongside yours have felt privileged to do so while focusing on the common goal of revitalizing so many local buildings of historical significant. The heart of our city has never looked more beautiful, and posterity will be the richer for it. ...I will highly recommend your firm to others. As a fundraising and development officer for the past 14 years, I’ve worked with many general contractors; none finer than Hightower Construction. ...The end result speaks for itself. Hightower Construction was the perfect choice for this challenging project. I was impressed by the lengths your team went to preserve not only the historic appearance of the exterior, but also the historic materials from which it was constructed. You found the proper mix of local and out-of-state craftspeople, contractors, and fabricators to ensure that the high quality of craftsmanship that went into building the cathedral over a hundred years ago was maintained throughout the entire restoration project. – Joseph J. Keenan, Palmetto Commercial Properties, Inc. ...I can’t thank you enough for the personal attention that you gave to this project and cannot commend to you more highly your excellent, professional staff. What a pleasure to work with all of these fine people. They made the task very enjoyable, and although hectic at times, never complained about the odd schedule required of a working church. The interruptions…required your staff to go above and beyond normal construction satisfaction limits; however, none complained and all pitched in. Although it was an enormous task that required extensive hours and coordination, with your proper management, we continued to offer Masses and administer the sacraments on a daily basis without hindrances. It was quite a remarkable accomplishment and all those involved should be commended.